Let’s pretend we have two teams each drafting one batter at C, 1B, 2B, SS, 3B, OF1, OF2, OF3. The roster of Team A is the following: Alex Rodriguez, Mark Reynolds, Jason Bay, Jayson Werth, Nelson Cruz, Ben Zobrist, Elvis Andrus, and Mike Napoli. The roster of Team B is the following: Adrian Gonzalez, Nick Markakis, Ryan Zimmerman, Adam Jones, Robinson Cano, Alex Rios, Orlando Cabrera, and Bengie Molina. Team A should be the far superior team if you go by any Average Draft Position measure. These are all heavy hitters who contribute some nice speed; however, when we take a look at projections, we’re not quite that certain that Team A would finish ahead of Team B. 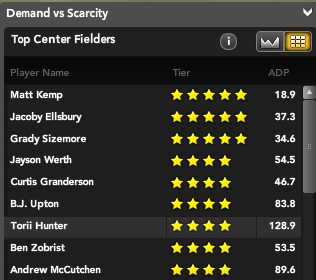 As you’ll see above, Team A has the clear upper-hand in HRs and SBs. However, Team B holds a small edge in RBIs and Rs and a big edge in AVG. How did we pull this trick? The answer tells us something important about player value and is something to keep in mind when using player raters and managing a roster into the season. 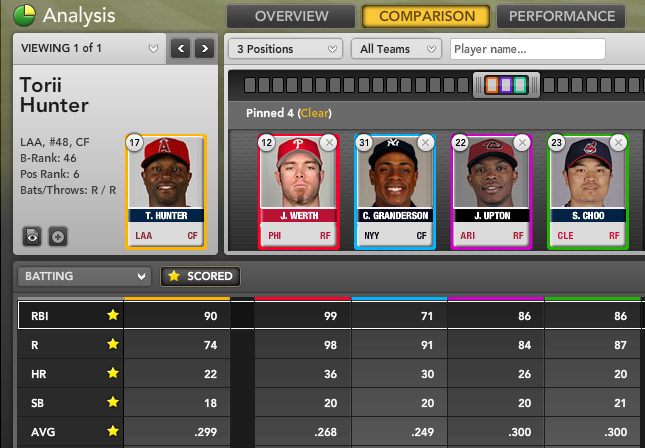 Team A is a squad comprised of the top-rated players at every position who each project for less than 550 at-bats. Team B is a squad comprised of players who are rated relatively lower compared to the other squad, but who each project for somewhere between 575 to 650 at-bats. In other words, the extra ABs translate to added counting numbers, particularly important in context stats such as R and RBI. In addition, more ABs mean a bigger contribution to the overall team average. Last year’s best best performers against draft position included Aaron Hill, Chone Figgins, and Victor Martinez. Is it a coincidence that each of these players led their position in ABs? We’re all trained to weight heavily the categories that are seemingly dependent on core skills like power and speed; player raters in particular give a little bit of extra credit to steals because of the overall scarcity. But HRs and SBs aren’t the only categories worth considering when taking a look at a player. And core skills are not the only factors worth examining. Teams doing well in undervalued categories and teams healthy enough to gain a playing time advantage can find their way to fantasy success, perhaps to the astonishment of their league-mates. For more on competitive factors in fantasy baseball, check out Bloomberg Sports’ fantasy kits. In 2009, only four players in baseball put up at least 90 RBIs, 16 SBs, and a .299 AVG — Hanley Ramirez, Albert Pujols, Ryan Braun, and Torii Hunter. hit at the top of the lineup and have only limited RBI opportunities. .299. Bloomberg Sports projects .289 for the upcoming season. as having the kind of statistical upside offered by many youngsters. breed. Just ask Pujols, Hanley, and Braun. 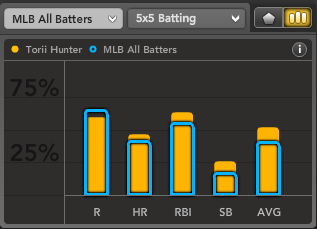 For more information on Torii Hunter and other speed-RBI options, check out Bloomberg Sports’ fantasy kit.